60 Years of the New York Convention addresses a wide range of legal issues related to the application of the New York Convention in the context of international commercial arbitration and international investment arbitration. Worldwide interest in the recognition and enforcement of arbitral awards has never been higher, and the New York Convention of 1958, currently adhered to by 159 States including the major trading nations, remains the most successful treaty in this area of commercial law. This incomparable book, marking the Convention’s 60th anniversary, provides a fully updated analysis of the Convention’s application from international, comparative, and national perspectives. There are also a number of fascinating reflections on the future of a convention that is about to welcome its 160th contracting State. Ample reference is made throughout to leading cases and practice. Familiarity with the intricacies of the New York Convention, as the most universally acknowledged framework in which cross-border economic exchanges can flourish, is essential for judges, practitioners, legal staff, business people, and scholars working with or applying international commercial arbitration anywhere in the world. This book’s combination of highly thought-provoking topics and the depth with which they are addressed will prove invaluable to all interested parties. The New York Convention and the Enforcement of Arbitration Agreements by National Courts: What Level of Review? The UN Convention on the Use of Electronic Communications in International Contracts: An Overlooked Remedy for Outdated Form Provisions under the New York Convention? Arbitral Preliminary References: The New York Convention Regime as Adequate Mechanism for Compliance under Article 267 TFEU? 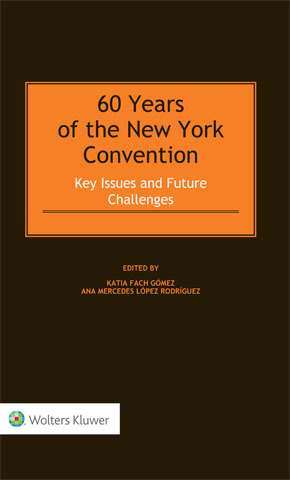 The New York Convention’s 60th Anniversary: A Restatement for the New York Convention? Time for a New NY Convention? Was Albert van den Berg Right? 60 Years of the New York Convention on the Recognition and Enforcement of Foreign Arbitral Awards 1958: Are We There Yet in Sub-Saharan Africa? The New York Convention and Investment Arbitration: Harmony or Tension?